Florida and California are synonymous with citrus fruit, and in particular, oranges; it would be a fair (yet incorrect) assumption that the sweet and juicy orb originated there (it is thought to originally have been first cultivated several thousand years ago in China). 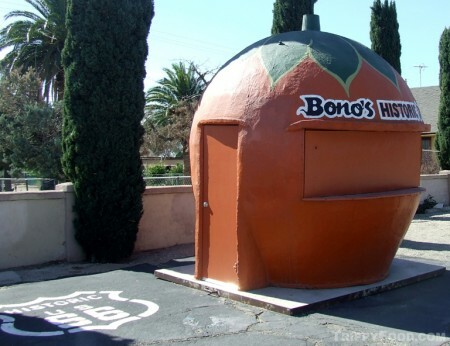 Both states have an Orange County and countless place names that pay tribute to the fruit, while there are orange trees in virtually every back yard. 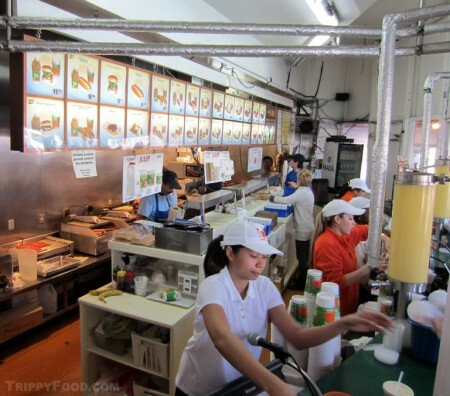 Each has had their fair share of historic orange-shaped buildings and shacks that Anita Bryant would be proud of, most of which vended orange juice in their former lives; few remain. Once such stand located conveniently along Route 66 in Fontana, California is labeled simply "Bono's Historic Orange". It was originally built in 1936 to quench the thirst of those who decided to motor west on the route that's the best through the desert towards the oasis of Los Angeles but has stood freshly painted yet unoccupied for years. 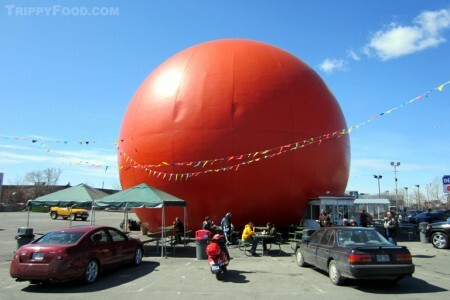 Although the defunct juice stand in San Bernardino County has come to be known as "Bono's Giant Orange", one juice stand in the Great White North of Montréal makes it look like a kumquat. Gibeau Orange Julep was originally built on Boulevard Décarie in the 1940s at a respectable two-stories high as a restaurant from which Hermas Gibeau could sell his unique Orange Julep drink to thirsty Montréalers and travelers alike. Gibeau also maintained other stands and restaurants in the Montréal area, with some also shaped (and colored) like oranges; however, the stand on the corner of Décarie and rue Paré is the only one remaining. When the boulevard was expanded in 1966, so was the globe - by the time it was completed, it had attained a forty-foot diameter and was (and is) visible from miles away. The restaurant portion is the only part of the structure with windows, with the entrance wrapping partway around the outside as if the orange had simply rolled on top of it. The gunite and plastic panels covering the colossal fruit are bereft of dimples and there's no obligatory stem and orange leaf on the top; with no signage on the outside of the structure it could easily be confused for a ball or a small planet. Inside, the counter wraps about halfway around with a ceiling and walls which hide most of the interior, allowing conjecture to take over - what's back there? A grove of orange trees? Orange-squeezing Oompa-Loompas? A series of tubes, chutes and raceways where oranges have their citrus lifeblood extracted in some Rube Goldbergesque mechanical juicing monstrosity? To further add to the mystery, foil-wrapped tubes extend from the back and deposit the frothy, orange beverage into tall, cylindrical glass holding tanks reminiscent of an old gas pump. 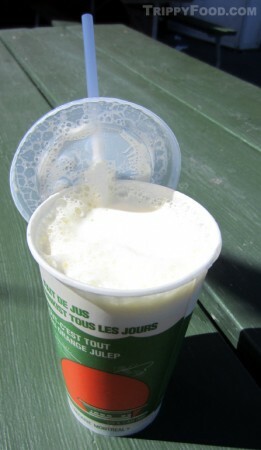 This entry was posted in Canada, Montréal, Montréal and tagged Canada, Creamsicle, Gibeau Orange Julep, hamburgers, Hermas Gibeau, hotdogs, Michigans, Montreal, Nathan's, Orange, Orange Bang, Orange Julep, Orange Julius, poutine, QC, Quebec. Bookmark the permalink. Hard to tell, Scott, but it looks like if Orange World was a whole orange instead of an inverted half it would be at least as big as Gibeau. Did they have a blended drink or just OJ?